The US-born Israeli filmmaker Joseph Cedar's last effort, which won the Silver Bear at Berlin, was Beatufort, a tense, excellent war film about a few members of the Israeli army making a dangerous last stand in south Lebanon in 2000. Footnote deals with a rather different topic -- textual analysis of the Hebrew Talmud. Now there's a change of pace, you will say. But not so much as might seem, because there is excitement here. Footnote is not an action movie but a tragicomedy -- about scholarly integrity; or is it futility? -- with enormous conflict, both repressed and open. It too, like Beaufort, centers compellingly on figures who wander a kind of half-abandoned but still dangerous battleground. It's also a deeply fascinating character study, and would warrant unhesitating recommendation were it not for a weak ending. Footnote is full of the ironies that arise out of family and occupational rivalry. 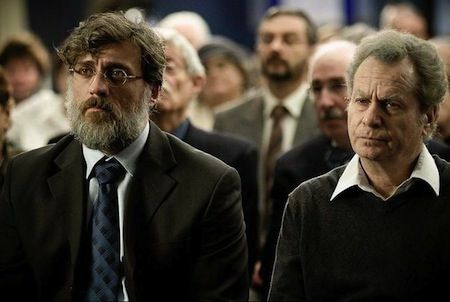 There is rich intentional ambivalence about the ways in which the film views each of its two main characters, father and son, both, -- this itself ironic -- Talmudic scholars. First is the father, Eliezer Shkolnik (Shlomo Bar-Aba), who has waited vainly for twenty years to receive the Israel Prize in his field. Cedar's own father, by the way, a biochemist, has received the Israel Prize in biology; he himself has studied the Talmud, so he knows whereof he speaks in more ways than one. Uriel Shkolnik (Lior Ashkenazi), Eliezer's son, is more popular among students and his peers, and receives an award as the film begins. At the awards ceremony he gives an ambiguous speech, mostly about his father, who sits stony-faced in the front row listening, not, it would seem, with any approval. The speech is entertaining, light, modest, a tribute to the father. But it also seems to mock him a little. Elieser already emerges from the speech and the way he listens to it as stubborn, dogmatic, and difficult. And if he is admirable, he is equally off-putting. Elieser is a pure philologist, who approaches the text as a text. His son's work, which speaks more of manners and customs at the time of the texts, he disdainfully refers to as "folkloric." The father turns out to have examined one version of the linguistically problematic Talmud for decades, seeking to suss out inconsistencies. And then another scholar found the other text that caused them, and published his finding before Elieser could, rendering Elieser's decades of work irrelevant. Elieser is a monumentally dedicated scholar. But what has he accomplished? It seems his highest honor is being mentioned as a footnote in the work of another distinguished Talmudic scholar. We cannot reveal what happens after that, but it's suspenseful and thought-provoking, and leaves us perhaps forever in doubt as to who is the better man. Is one indeed less fatuous than the other? There probably hasn't been a much better or deeper or more telling on screen look at the jealousies and passions that surround certain kinds of academic work and the ways certain scholars (or brilliant, egocentric men) construct a fortress (a key word in the film) around themselves, the ivory tower protection from the real world. And the immense uncertainty of achievement in narrow fields that few understand or really know about. And then of course there is the question, held suspensefully in the balance almost to the very end: which will win out, professional ambition or family loyalty? Cedar turns the finale into a meaningless extravaganza in which both the bitter and the comic sides of the story fade into mere spectacle. The film winds up feeling like a memorable little short story that, unfortunately, its author didn't know how to end. But even without an ending this is a strong and original film. Other characters are also important, such as the chief back-stabber, Yehuda Grossman (Micah Lewesohn, whose brow looks like an exposed brain). Alma Zak and Alisa Rosen are good too as the wives of Urial and Elieser, respectively. And then there is also Uriel's young son (whose name I can't find), a beautiful young man, who is also ambiguous. Is he a useless time-waster, as Uriel suspects, or a free spirit about to choose a different, perhaps more interesting, path? Footnote was in Competition in May 2011 at Cannes, where it was nominated for the Palme d'Or and won the Best Screenplay award, and also shown at Toronto and New York; at the latter it was screened for this review. Sony Classics has bought the film for US distribution. French release is slated for November 30, 2011.